While most homeowners have used a power strip or extension cord at one time or another, few are aware of the dangers associated with using them incorrectly. Today’s households have more electronics than ever, requiring more outlet space than most homes provide. As a result, many homeowners rely on power strips and extension cords on a regular basis, which can be a potential hazard. It is important to learn how to properly use power strips and effectively utilize extension cords to power all of your gadgets, tools, and appliances. However, in many situations, it just might be time to update electrical wiring in North Shore for the best and safest results. A power strip is a type of electrical connector that features a length of cable, which plugs into the outlet, and a row of sockets. The electrical sockets can be used to plug in multiple appliances. 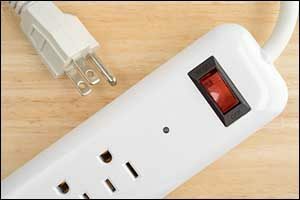 Most power strips promise surge protection, particularly for computers and other sensitive appliances. They are used in homes for personal computers and electronics, as well as in office settings. Unfortunately, these strips can easily cause an individual to overload an outlet by plugging in too many items at once. Power strips are meant to be used as a temporary fix, not a permanent solution. Most people have used an extension cord at one time or another. Similar to power strips, there is usually a much longer cord, hence the use of the word “extension” in the description. In most cases, there is typically room to plug one or two items into the extension cord. Some cords only allow the use of two-prong plugs, while others are designed for three-prong cords as well. Extension cords are considered to be “less stable” than power strips. They should never be used for more than a few hours at a time and definitely not be used as a long-term or permanent solution. In spite of the way that most people use power strips, there are a lot of “rules” regarding these handy tools that you need to know. The manufacturer might not even provide this type of information, so the more you can learn on your own, the better. Consult with Greater Boston commercial electrical services to ensure that you have adequate outlets and proper voltage in your home or business to meet your needs. Instead of relying on power strips and extension cords, consider hiring a pro to update electrical wiring in North Shore. It pays to work with a service provider who has experience with the type of work that you need to have done. Small Loads – Power strips are designed to provide small amounts of power to multiple devices. One example would be plugging in a lamp near your computer or phone charger so you can see what you are doing. Only small loads should be used with a power strip. They are not designed to handle major appliances, such as power tools or temporary space heaters. Temporary Use – A power strip or extension cord should never be used as a workaround or permanent solution for plugging in daily use items. They lack the stability required to provide long-term use, even for smaller items. If you require more power to a certain area on a regular basis, contact electrical repair services or electrical services for commercial upgrades in your local area. Check the Voltage – There are different types of power strips, depending on your needs. Make sure that you won’t be exceeding the safe voltage rating for a power strip by plugging in just one more electronic item. Make sure the strip has a surge protector included to protect your devices and appliances from harm in the event of a power surge. If you aren’t sure, consider another option. Multiple Strips and Cords – Never use power strips and cords with other power strips and cords. If you need an extra foot of cord to reach something, purchase a longer cord. If you need to plug in more items, contact Greater Boston commercial electrical services to upgrade your home wiring. Don’t plug strips or extension cords into multiple outlet devices either. It can quickly overload the system and possibly result in an electrical fire or costly damage that would require electrical repair services. If you find that you are using power strips and extension cords frequently around your home, contact our electrical services for commercial and residential clients. We can provide you with safe solutions and make suggestions for upgrades that will create a more effective working environment. Call 1-857-829-0516 to get a FREE estimate for any of the professional services that we offer at our Greater Boston commercial electrical service.